We go through life, working, running, thinking, learning, changing all the time. We thrive on new experiences and dream of amazing adventures… and, surprise, they are all around us! So many big decisions so many important things to be done. How grateful we should always be for the simple things life has to offer. It’s different for everyone, some of my favorite things are dirt and plants and baby animals. 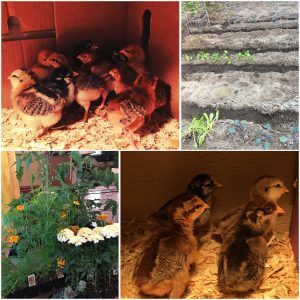 Planting a garden and taking care of a tiny baby chick reset my brain and recharge my battery. I love my family, I love my career as a real estate agent and I know that in order to do my best for them I have to take care of myself! I hope everyone who reads this feels the same. Take some time, find out what inspires you, remember what made you happy when you were a kid and go do it! Reset your brain, recharge your battery, take care of yourself and then go conquer the world!